Figure 14.5a shows a top view of a horizontal disk of radius A with a ball attached to its rim at point Q. The disk rotates with constant angular speed v (measured in rad/s), so the ball moves in uniform circular motion. A horizontal light beam casts a shadow of the ball on a screen. 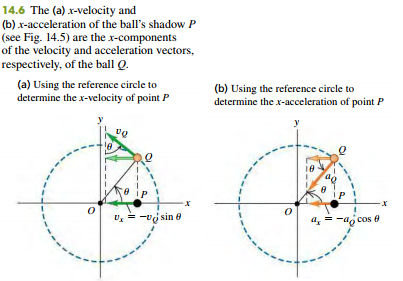 The shadow at point P oscillates back and forth as the ball moves in a circle. We then arrange a body attached to an ideal spring, like the combination shown in Figs. 14.1 and 14.2, so that the body oscillates parallel to the shadow. We will prove that the motions of the body and of the ball’s shadow are identical if the amplitude of the body’s oscillation is equal to the disk radius A, and if the angular frequency 2pf of the oscillating body is equal to the angular speed v of the rotating disk. That is, simple harmonic motion is the projection of uniform circular motion onto a diameter. We can verify this remarkable statement by finding the acceleration of the shadow at P and comparing it to the acceleration of a body undergoing SHM, given by Eq. (14.4). The circle in which the ball moves so that its projection matches the motion of the oscillating body is called the reference circle; we will call the point Q the reference point. We take the reference circle to lie in the xy-plane, with the origin O at the center of the circle (Fig. 14.5b). At time t the vector OQ from the origin to reference point Q makes an angle u with the positive x-axis. As point Q moves around the reference circle with constant angular speed v, vector OQ rotates with the same angular speed. Such a rotating vector is called a phasor. (This term was in use long before the invention of the Star Trek stun gun with a similar name.) We’ll use phasors again when we study alternating-current circuits in Chapter 31 and the interference of light in Chapters 35 and 36. The acceleration of point P is directly proportional to the displacement x and always has the opposite sign. These are precisely the hallmarks of simple harmonic motion. When you start a body oscillating in SHM, the value of v is not yours to choose; it is predetermined by the values of k and m. The units of k are N/m or kg/s 2 , so k>m is in (kg>s 2 )/kg = s -2 . When we take the square root in Eq. (14.10), we get s -1 , or more properly rad/s because this is an angular frequency (recall that a radian is not a true unit). We see from Eq. (14.12) that a larger mass m will have less acceleration and take a longer time for a complete cycle (Fig. 14.7). A stiffer spring (one with a larger force constant k) exerts a greater force at a given deformation x, causing greater acceleration and a shorter time T per cycle.